There are different kinds of good days on the bike. Some good days are just that, effortless excursions filled with vistas, friends and food. They blend together and while you can't pinpoint exactly what was so good about a certain one, you look back fondly and with a smile. Day 3 was the other kind of good day; the kind that throws so much at you that your jaw hurts from dropping all day. The kind where new never ceases and limits seem infinite. The kind you can picture from beginning to end without hesitation or doubt. It is because of days like Day 3 that you take your bike on vacations. Travel by two wheels is the perfect method of discovery, what better way to see a new land unfurl in front of you than on a machine that brings you utter joy? After our insanely long and tiresome day before, we took a leisurely start in Geilo. A long breakfast coupled with an attempt to eat more cheese, waffles, granola, and coffee than ever in my life in preparation for the mountains. Geilo, a known ski and mountain bike destination wasn't lacking in shopping opportunities, so we reveled in the glory of European ski and bike products until the inevitable road and immediate climb could be avoided no longer. 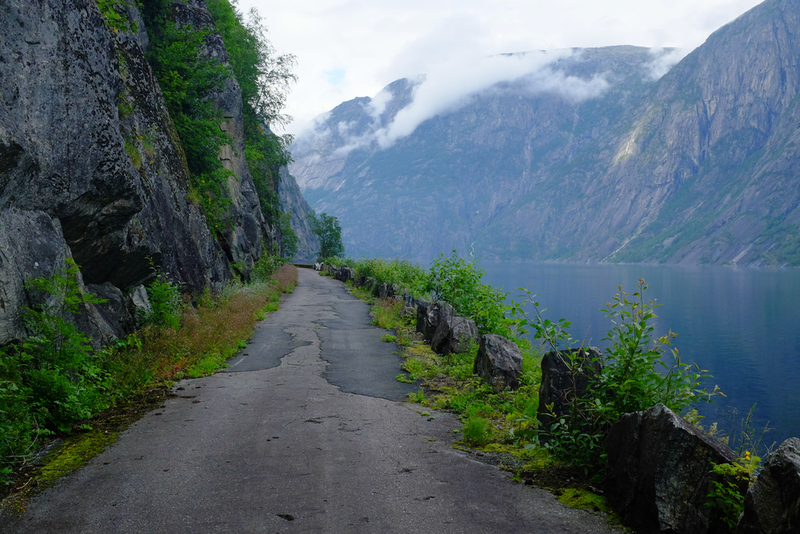 The road was graced with green shrubs and dotted with flowers, a nice contrast to the deep black pavement. Only a few miles later we saw no fewer than a team of 25 laying down this perfect tarmac. 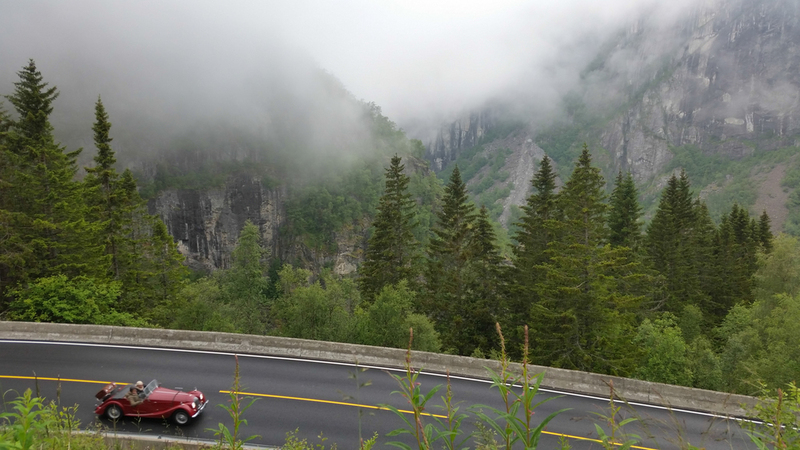 It was our only glimpse into the perfect engineering that goes into Norway's roads. They are seamless, and throughout the country we saw so many freshly paved beauties. 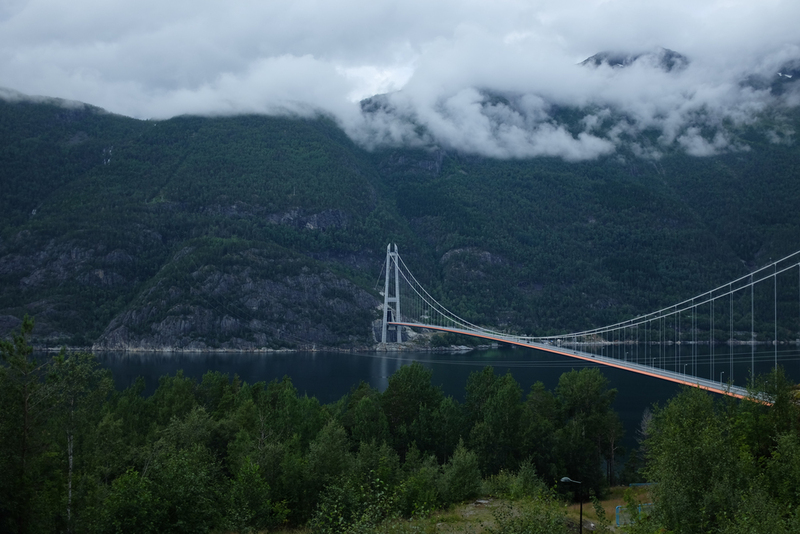 After a long but gentle climb we hit grey skies and the intersection with the Rallervegen. It was the perfect time to stop for a coffee, jacket and advice. It was also the moment when we first felt the kink in our overall route. The Rallervegen goes 130 miles Northwest and is a must do. But it was too late to add it in. We were told our route for the next 50 miles was difficult on bicycle because of the tunnels, but there was no other way around. With caffeine courage, we took to it with the highest of hope but dampened expectations. From there we climbed over a pass through the Skaupsjøen/ Hardangerjøkulen national park. Layers and layers of rocky plateau with meandering creeks led us higher and higher until snow sat on the side of the roads and a light rain fell from the sky. The summit of course meant a coffee and food stop. Warmed by soup and coffee, the descent was daunting. The temperature hovered around 40 Celsius and the light rain threatened to get worse. I had minimal jackets and saw only one solution. Covered in long gloves, a neck gater, vest, and a light rain jacket, I ran out of the cafe for my bike, hopped on as quickly as I could and immediately began to pedal down the hill as hard as I could, eventually spinning out in the hardest gear. The gater funneled my hot breath to my core and the jacket kept me in, while the hard effort kept me warm in spite of the outside chill. As we were on a more major road, the curves were wide, the pavement fresh and the gradients not too intense and I didn't need to touch the brakes a single time. What seemed a chilly proposition turned out to be the funnest descent I'd done. Ever. Cue the tunnels. I was descending so fast the first one came out of nowhere and I didn't even notice the bike route that avoided it. It was lit and I had my light on my handlebars, but I was quickly thrown into a dark vortex. 10 meters in and all trace of natural light disappeared. A heavy claustrophobia took its place, intensified as the tunnel took a sweeping turn to the right. All I could do was breathe and hope I'd be out soon. And there it was, light, and refound hope. The tunnel had been no more than 100 meters but the darkness felt as if I'd been plunged into the see without hope of escape. Vertigo grasped be as it had never before. I pulled quickly into a rest area right out of the tunnel, and saw salvation in a bike path. It had a familiar feeling as it was doused in fog. It turns out the bike path led all the way down the canyon. A waterfall roared to one side, unseen to the cars subjected to the tunnel. The path was ours and ours alone, meandering down along the river as granite walls towered over us. We got to a town, and the river became a fjord, our first fjord, which was a perfect place for our standard way too late lunch. As we ate on the side of the path we noticed wild raspberries growing, and foraged in utter delight. That day we had seen so many buses or tourists being shepherded around, yet they would never have magical moments like these. Most of the rest of our ride was on paths off the main road, only for bikes. We were closer to the water at times, closer to the mountains at others. We felt the sun on our backs at the end of the day, not blocked by car windows. It was such a good day because not only was it all knew, but the way we experienced the land was so unique to our method of travel, we couldn't have had the same day in a car, on foot, especially in a tourist bus. You can't trade those days for anything.